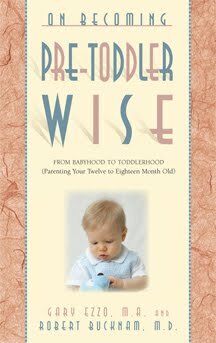 Pre-Toddlerwise reminds parents to stick to their routines. I would add to continue to offer things like food options, but don’t make it a huge battle. Continue to require things like independent playtime. And keep in mind the post of Don’t Lose Ground. There were a couple of days for McKenna during this time period when she cried for the first minute or so of independent playtime. But after that minute, she played happily and continued on day after day loving it. “Persevere is to persist or remain committed to a purpose or task in the face of obstacles” (page 29). For the things that matter, stick to your goals. This reminds me of the morning that McKenna, who was about 15-16 months old, refused to sign “more” when she wanted more at breakfast. This was a sign she had been adept at for months. For whatever reason, she did not want to sign more that morning. She preferred to scream at me. She pointed at the food, but refused to sign more. I persevered. I considered for a moment and decided this was a battle it would not be wise to lose. I could foresee that if I gave in, she would learn both that tantrums are productive and that “more” is an unnecessary form of communication. We walked away from the table that morning with McKenna not getting more. She would not give in, and neither would I. At lunch time, when McKenna wanted more of something, she signed more immediately. And now as she approaches 19 months old, I still have yet to have a “more” issue. “…the more you can show your child what to do, the faster her learns” (page 30). Consider this, you might be explaining something to your child and the words you are using mean nothing to the child. Or perhaps the words can make sense, but not in the context you are using them. Everything is new to your child. The more you can “show and tell” your child, the faster she will understand what you want her to do or what you expect of her. If you want her to fold her arms and close her eyes for prayer, do it yourself. You also might need to physically put her arms together for her so she sees that you want her to imitate you. Context is a topic that cannot necessarily be summarized neatly in one little paragraph. I have written some posts on context to help you better understand and apply it, so be sure to refer to those if you need further information. Context means you consider a lot of factors in a situation. If you take something out of context, you can always skew the meaning. Always. You can easily quote something out of context and turn it to mean whatever you want to, which is why it is always wise to get to the root of the source to understand it in its original context. There are sites that use quotes from my blog to try to bolster their arguments against Babywise. If you follow their link back to my site (which frankly surprises me that they link back to this site–I guess that just shows their confidence that people won’t follow it), and read the information in context, you will quickly see the words quoted were arguments for, not against, Babywise. So far as parenting goes, there might be times when you consider the context of the situation and decide your overly tired child does not need any discipline for misbehavior other than an early bedtime :). You will use context often throughout your parenting career. Be careful you don’t take context too far and let behaviors happen that you really aren’t okay with. If your child hits when she is tired, that doesn’t mean you allow her to hit. You might not do a formal punishment, but it also doesn’t mean you allow her to play with other children if she hits them–tired or not. There you have your words to live by. They can help you make it through this new toddler transition with more sanity and less worry.